My custom aluminum pommel needed a bit more texture and something was needed to cover the preexisting hole in its side so I decided to design a little dragon emblem. 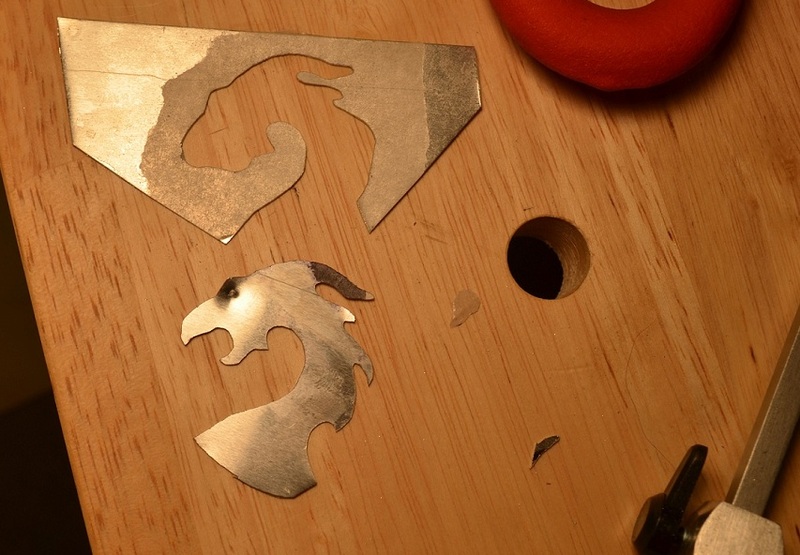 22 gauge aluminum sheet metal was cut using a Jeweler’s Saw fit with a 2/0 blade. I original gathered all my sheet metal tools in prep for my next project of steel gauntlets which is still in the design phase. I knew I’d need some sheet metal shears but I discovered the jewelers saw and how it could create the small details I wanted without distorting the sheet metal in the way that snips tend to. 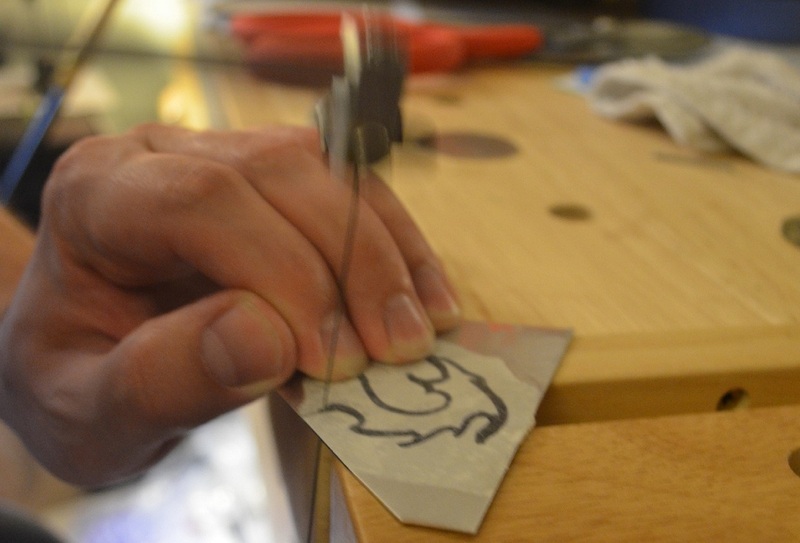 One of resources that helped guide me was from Rings & Things: Tips for sawing sheet metal with a jeweler’s saw. After drawing up a pattern and gluing it to the sheet I got right to cutting. After a bit of fussing with the saw to figure how sharp of and angle I could cut with the saw it turned into a simple task of keeping my sawing motions smooth as to not break the blade. Iwanted the brand new emblem to not look so new to better match the age of the sword at whole so I used a bit of acrylic paint and some dry brushing to add a bit a real life experience to it after I filed down and rounded the edges. I am now the proud owner of my very own two handed sword. No more running around the back yard with a red sheet secured to my back with two stick lashed together as my mighty Excalibur. I was able to take this off the hands of an local individual on Craigslist for a low $25. Its a bit beaten up, the blade is spotted with rust, mini nicks, and the metal has dulled from sitting unused and un-oiled for some extended period of time. Time to put a bit of life into it! 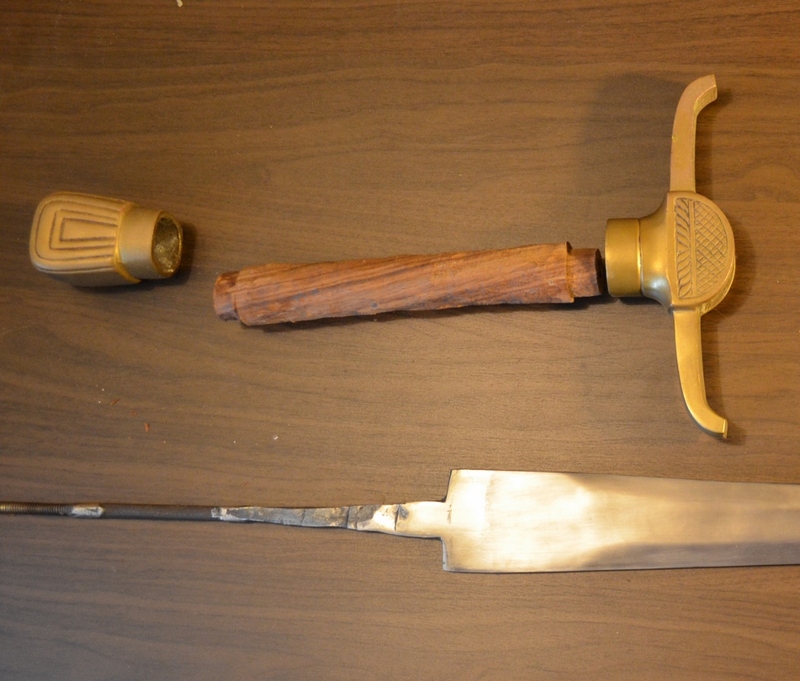 Since this is a cheaper stage prop sword it is assembled with a top screw so disassembling it was rather simple. After about 2 hours of sanding, buffing and polishing the blade to return its clean shine the first thing that needed a change was the handle. Holding this thing feels like I’m holding a baseball bat at the wrong end so the handle diameter needs to be reduced so I can later add a nice leather wrap to it. This will be a job for my Dremel since my dreams of a lathe have yet to be fully realized. After reassembling it I feel that the pommel was also oversized and a bit odd looking. I cant just modify this piece since its a hollow bronze cast object that can be ruduced in size by removing material. I do have some extra 2″ diameter aluminum bar stock from another project around that I can hack saw my way through and see if it work aesthetically. 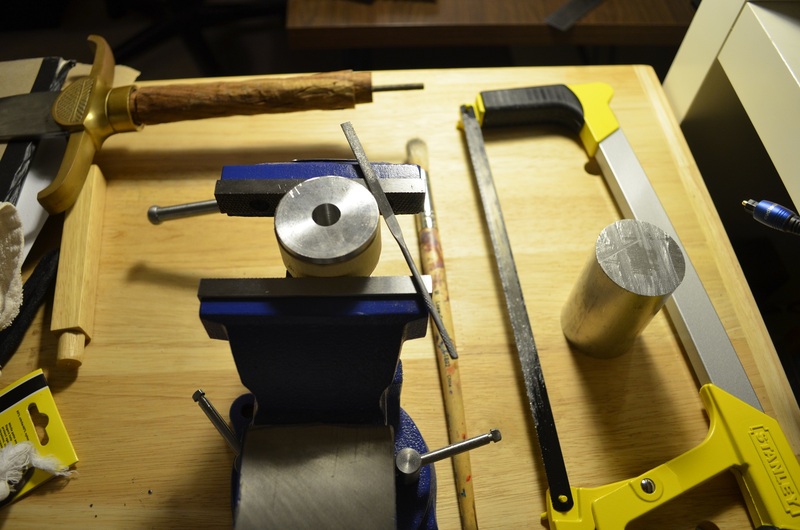 After an upgrade from a coping saw to a proper hack saw and a bit of machine oil to prevent the blade from binding I was able to remove an piece of the aluminum bar stock to become my new pommel. Unfortunately the end that i cut off the larger stock which had a diameter previously reduced, which I felt was a better size, had a hole in the center which I will need to find a way to hide later. The next step is to drill a hole through to accept the blades threaded end. This will be done with a hand drill as I’m yet to find room or funds for a drill press at the time.